(Andrew Brown | The Kroger Co. via Associated Press) This undated image provided by The Kroger Co. shows an autonomous vehicle called the R1. Nuro and grocery chain Kroger are teaming up to bring unmanned delivery service to customers. 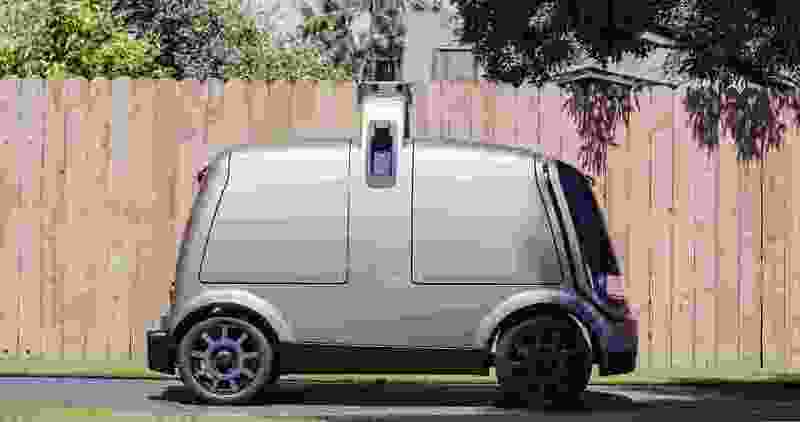 The companies said Tuesday, Dec. 18, 2018, that Nuro's unmanned vehicle, the R1, will be added to a fleet of autonomous Prius vehicles that have run self-driving grocery delivery service in Scottsdale, Ariz., with vehicle operators since August. A bill to fully legalize driverless autonomous vehicles anywhere on Utah roads easily motored its way to final passage Friday, and is now on its way to Gov. Gary Herbert for his consideration. The Senate passed HB101 on a 23-0 vote with little debate. The House also earlier passed it unanimously. It aims mostly to allow developers of self-driving cars to move testing away from closed tracks and onto public roads. Its sponsor, Rep. Robert Spendlove, R-Sandy, said several companies are interested in doing that here as soon as the bill becomes law. Such testing is already occurring in Arizona, California and Pennsylvania. Spendlove earlier told lawmakers that self-driving cars so far have proven to be far safer than human-operated vehicles. That’s because they will never have problems with drunken driving or distracted driving — such as while using a cellphone — and their programming forces them to obey speed limits and other traffic laws. “It’s really the next stop to getting toward zero fatalities,” Jason Davis, deputy director of the Utah Department of Transportation, earlier told lawmakers. He added that 36,000 people die on the nation’s roads each year, and 94 percent are caused by human error — which self-driving cars may reduce. Besides improving safety, they also may allow the blind, disabled, old and young who normally cannot drive to transport themselves. Additionally, they could allow roads to carry more cars because self-driving vehicles can follow each other at shorter intervals. Besides allowing self-driving cars on Utah roads, the bill would require autonomous vehicles to be licensed and registered. It would amend the law to no longer assume a driver is human, but to allow one to be an autonomous system. It also would create a framework to determine liability in accidents, and what sort of information from a self-driving car’s data recordings must be released. It would establish different rules for different levels of autonomy — such as those that offer basic cruise control or lane assist to those cars that can literally drive themselves to a destination to pick up a passenger. Spendlove said technology is changing so rapidly that lawmakers likely will need to tweak the law continually for years to come.